BALTIMORE--(BUSINESS WIRE)--Merritt Construction Services, the construction arm of Merritt Properties, has been selected by Holly Poultry to build a ground-up, USDA poultry processing facility in Baltimore, Maryland. The new facility will allow this local business to better serve its customers and also expand its workforce, increase production and repurpose an obsolete industrial site in the city. 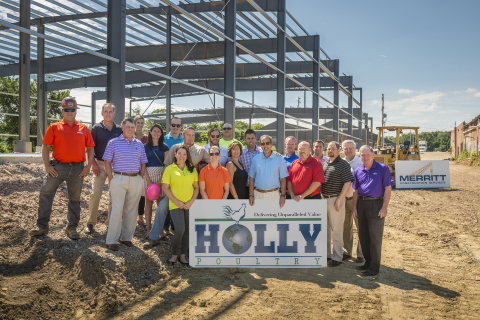 Located at 2121 Wicomico Street, the new 37,500-square-foot building will allow Holly Poultry to separate its processing business from its wholesale commodity business. This internal structure will give Holly Poultry the opportunity to penetrate existing markets more deeply, explore new markets and accelerate growth. "For the past several years, Holly's growth has been hampered by lack of space,” said Zach Fine, Vice President of Holly Poultry. “Now, working with Merritt, we are taking 17 acres of urban blight and turning it into a state-of-the-art processing facility." Holly Poultry, a family-owned business, is a further processor of poultry products and a wholesale distributor of poultry, pork, beef and other refrigerated products. Holly has been in business in Baltimore City under the current management since 1990, growing from 20 employees to over 180, most of whom are City residents. In order to accommodate the company's requirements for additional processing capacity, the owners purchased a 17-acre site adjacent to the company's current facility located in the St. Paul’s Community of Baltimore. Merritt has already broken ground on the former Maryland Glass Corporation factory site where cobalt blue bottles and jars for Bromo Seltzer and Noxzema were formerly produced until 1980 when Maryland Glass went out of business. The new poultry processing facility will repurpose the obsolete industrial site and give Holly Poultry the space they need to continue to expand their product offerings. The expansion is expected to result in the hiring of an additional 100 full-time employees. This facility will also feature a new test kitchen and new equipment including conveyors, marinating, sizing and deboning lines. In addition, this project is pursuing energy and environmental design in accordance with the Baltimore City Green Building Code. Steel is currently being set for the new state-of-the-art USDA poultry processing facility and is expected to be operational in January 2017. Holly Poultry then plans to renovate their existing facility which will house the wholesale commodity division of the business. For more information on Holly Poultry, please visit their website at www.hollypoultry.com. With a project portfolio of nearly 16 million square feet, Merritt has been providing site development, general construction, redevelopment and interior renovations for nearly 50 years. Whether serving as general contractor, construction manager or design-builder, Merritt Construction Services offers full-service construction capabilities through all phases of development, from feasibility to commissioning. Merritt’s highly skilled construction team has completed a comprehensive roster of customized projects, including corporate campuses, LEED-certified green buildings, schools, manufacturing facilities and retail centers. For more information about Merritt Construction Services: merrittconstruction.com, twitter.com/merrittcs, facebook.com/MerrittConstructionServices. Group photo of Merritt and Holly employees available upon request. Merritt Construction Services and Holly Poultry team up to build ground-up USDA poultry processing facility in Baltimore, Maryland.